Damage from noise exposure of sufficient intensity and duration is well established and hearing loss may be temporary or permanent. Fortunately, noise exposure can be controlled and technology exists to reduce the hazards. Aside from employer/employee concern with the inherent hazards of noise, added attention has been brought to focus on the subject through regulatory requirements. Under the Occupational Safety and Health Act (OSHA) every employer is legally responsible for providing a workplace free of hazards such as excessive noise. It has been estimated that 14 million US workers are exposed to hazardous noise. This book is presented as an overview summary for employers, workers, and supervisors interested in workplace noise and its control. We believe that in order to understand and control noise it is not necessary to be highly technical. Noise problems can quite often be solved by the people who are directly affected. 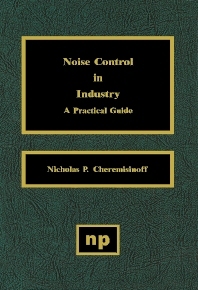 Presented is an overview of noise, the regulations concerning its control, an explanation of specific principles, and a discussion of some particular techniques. Employers, workers, and supervisors interested in workplace noise and its control.